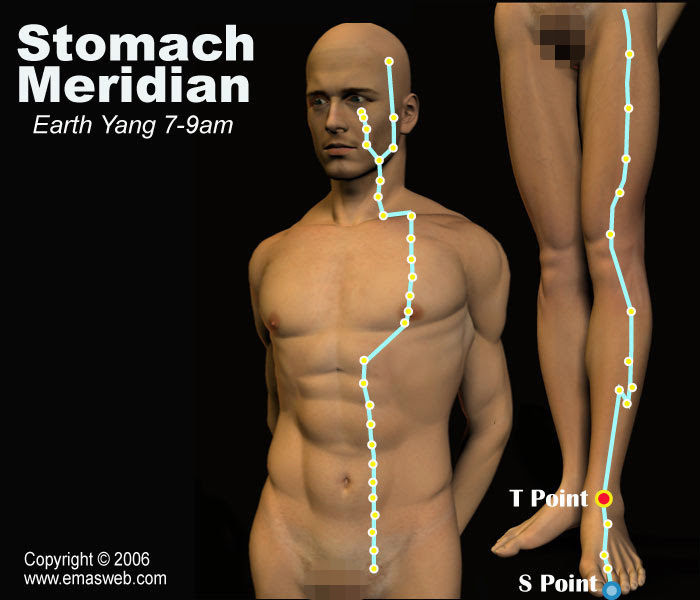 The Stomach Meridian connects with the Spleen Meridian, with which it is externally-internally related. Symptoms of the Stomach Meridian include stomachache, easily hungry, vomiting, thirst, etc. Abnormalities in the circulation of the Stomach Meridian will result in borborygmus, edema, sore throat, chest pain, epistaxis, etc. Qi is an essential substance of the human body. Qi produced by the Stomach and Spleen provides nourishment and energy for the whole body. Keeping the Stomach Meridian healthy may make the body stronger and more beautiful, and also strengthen the functions of the organs and prevent disease. Peak qi and blood flow in the Stomach Meridian is from 7:00 am to 9:00 am. 1.Diseases of the digestive system. 2.Diseases of the nervous system. 3.Diseases of the respiratory system. 4.Diseases of the circulatory system. 5.Diseases of the throat, head, face, mouth, teeth, nose, etc. 6.Diseases along the course of the Stomach Meridian.